Ben Belton and Zack Bresko split the goalie work at East Kentwood. Help Michigan a couple of bucks at a time. Michigan is in trouble. Since it is my favorite state I want to do what ever I can to help and so should my fellow Michigan residents. Since we cannot all go out and buy a Detroit made car tomorrow, what can we do? Well, Julie and I have been trying to buy day to day consumables that come from as close to home as possible. Think local, then regional, then Michigan and lastly look for products made in the US. BREAD - the staff of life. Patronize your local bakery - not only will you be supporting local people, but the quality of the bread you eat will be much better than something made at some giant place 3 states away and loaded with enough preservatives to keep it "fresh" on the shelf at the store for 3 weeks. Get some bread that was made the same day you buy it. Mexico City is cleaning up the air. I love it when I get to see some good news on the environmental front. I just read in The Week that Mexico City has made some very big improvements in their air quality over the last 15 years or so. They have really stepped up public transportation and curbed driving so much. In addition they enacted some tough environmental standards. In the past things were so bad that birds would drop dead while flying and kids drew pictures with the sky colored brown - not blue. Lead levels in the air are down 95 percent. Sulfur dioxide is down 86 percent. Carbon monoxide is down 74 percent. I would imagine the air there can still present a challenge to breathe when compared to the nice air I enjoy in the country outside Grand Rapids, Michigan. But I thought such efforts AND RESULTS should be noised about and celebrated. Aerostich tire studs make winter MORE fun. Winter has been real wintery, hasn't it? All the snow and ice have cut down on my riding time, so I decided to do something about it. Ordered some very small self-tapping studs from the fine folks at Aerostich. Got them installed and while I might not be ready to ice race, me and my XT550 can handle the commute to work and riding around the neighborhood now. 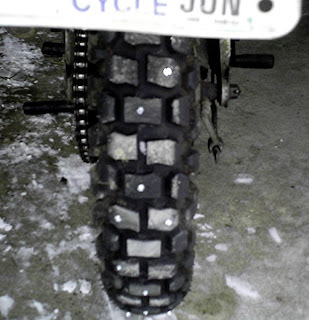 Here is a view of the rear tire with studs installed. First real test - can we make it up this hill on an ice covered dirt road?Yup - the rear end wiggles around some, but we made it. Lindsey Scheltema: This young lady loves to ride MX motorcycles. Lindsey Scheltema, a 2006 South Christian graduate, could be featured for her ability to juggle, but we are going to focus on her love affair with motocross racing instead. It all started when the oldest child of Rick and Cindy Scheltema started riding with her dad and then was given her own 80cc dirt bike to learn on. She competed in her first race at 8 years old at the Hudsonville Fairgrounds. Scheltema became so involved in motocross competition that she finished high school early so that she could get out on the women’s professional circuit. A blog called SuperForest and saving seeds. Don't cha love the interweb? You can find the coolest people out there. One day whilst surfing around I found a blog called Super Forest. What a great combination of uplifting stuff along with challenges to do better by our planet. Super Forest is very much behind the Millennium Seed Bank. What is that, says you? "The Millennium Seed Bank Project is an international conservation project coordinated by the Royal Botanic Gardens, Kew. Launched in the year 2000... its purpose is to provide an "insurance policy" against the extinction of plants in the wild by storing seeds for future use. The storage facilities consist of large underground frozen vaults preserving the world's largest collection of seeds.In April 2007 it banked its billionth seed, the Oxytenanthera abyssinica, a type of African bamboo." Anyway - the folks at Super Forest are raising awareness and raising funds to save one seed. My predictions for President Obama. First let me say that I hope the following viewpoint turns out to be ALL wrong. I don't think Mr. Obama is going to usher in very much change at all. Sure, he might be at the helm for some giant government employment programs, but what I am talking about is serious change - the kind of change that was promised and/or implied in his whole campaign. If you take a look at the people he has appointed on his team then you might see that there are indications that it is going to be Business As Usual. I don't think he will pull us out of Iraq all that quickly. At the same time I think he is going to get us further involved militarily in other countries. Buy Michigan Now is a great website. Have you been to Buy Michigan Now? it is a great website that is all about supporting our state. They have tips on how you can focus your shopping and direct more money to support Michigan business. There is a pledge you can take to support Michigan businesses. And they list all kinds of businesses with products made in our great state. It really got me thinking and now when I shop for groceries or anything else, I start with the narrow focus of "how can I spend my money to best benefit my local economy", then I widen that to "regional economy", then I widen that to include anything in the state of Michigan. Every little bit helps. It might cost a little bit more to buy something from a local provider than it does at a big box chain, but the local business owners are the ones who keep things afloat in YOUR neighborhood. It was not ALL bad news for Michigan.